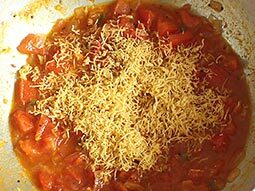 Sev tameta nu shaak is a popular Gujarati style sweet and sour tomato curry prepared with tomato, sev, onion and other Indian curry spices. 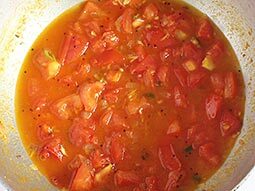 In this recipe, first tomatoes, onion and spices are sauteed in oil and then cooked with water, sev is added only toward its final stage of preparation. 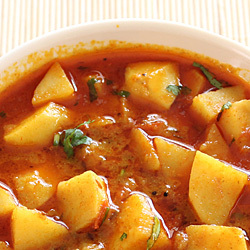 Serve it with paratha and thepla for a delicious meal. Heat oil in a kadai over medium flame. 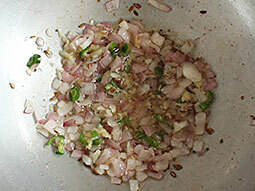 Add mustard seeds and cumin seeds; when they begin to splutter, add chopped onion and sauté until it turns light brown. Add ginger-garlic paste and chopped green chillies, sauté for 15-20 seconds. 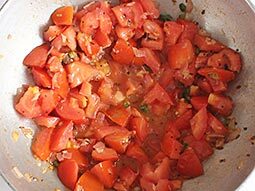 Add chopped tomatoes and sauté them for a minute. Add and mix salt, sugar and turmeric powder. Cook on medium flame for 2-3 minutes. 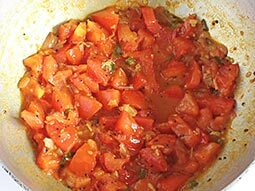 Add 1/2 cup water, mix well and cook until tomatoes become soft (around 4-5 minutes). Stir in between occasionally. Add red chilli powder, garam masala powder, coriander powder and sev. Mix well and cook for 1-2 minutes. Turn off the flame. Transfer prepared sev tameta nu shaak to a serving bowl and garnish with green coriander leaves. Serve it hot with chappati, thepla or paratha. If you want more gravy, add more water because sev absorbs the water of gravy. Adjust quantity of red chilli powder, and green chilli according to your taste to make it more or less spicy. Serving Ideas: Serve it with plain paratha or bhakhri (a thick roasted Gujarati bread). Very delicious and yummy.Thank you. Tried the recipe. Very tasty! Loved it! Awesome sabji. I've tried many of your recipes and all turned out very good. Thank you so much. Thank you so much for the recipe. I made it. It turned out to be awesome and yummy. Only thing I modified was I put haldiram lasun sev. Response: Hi, thanks for trying the recipe. 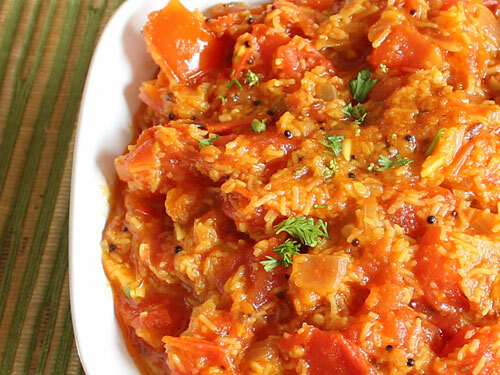 You can use any sev or gathiya in this curry. Thanks for this recipe. It was superb. I tried today, it was nice. My mom likes it so much. I tried it today. 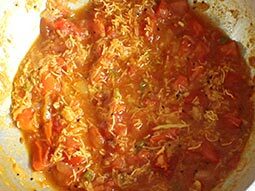 Sev Tomato Nu Saak is very tasty. thanks for the step wise directions and photos. trying it for the first time. think it will turn out nice. So simple & easy step by step Directions to make sev tamatar sabzi. I like it very much.